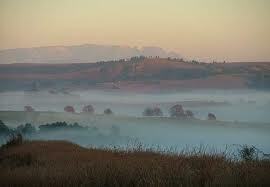 Mooi River is a small town a few kilometers off the N3 and is a gateway to the Central Drakensberg and Natal midlands. In fact Mooi River is a very good location to access the Battlefields, Giants Castle and Kamberg as well as the Natal Midlands. The Mooi River area offers accommodation as gracious splendour and rural simplicity. The Mooi River area also has varied and interesting places to visit. Mooi River sports stud farms, game, fly-fishing, Drakensberg, battlefields, bush, flora and fauna, St. Andrew Church (dedicated in 1905), Zulu dancing, museums, top schools and local arts and crafts and the Midlands Meander to list but a few of the attractions. Mooi River also has a Military Cemetery, offers township tours and has an Alpaca farm where alpaca products are for sale. There are a number of quaint restaurants offering 5-star dining in a safe environment. Wild Berry Guest Farm accommodation in Mooi River. On the Giants Castle Rd. 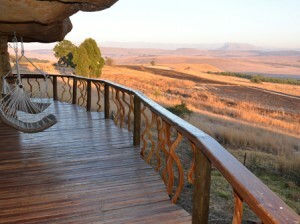 Wild Berry, set in the heart of the Drakensberg is a birdwatchers dream. An ideal base to discover the local attractions, explore the farm or enjoy a game of chess or have a quiet (romantic) break. Sierra Ranch – family resort & conference centre accommodation in Mooi River. The shareholders, management and staff of Sierra Ranch would like to thank you for your interest in our resort and invite you to visit us in the heart of the Natal midlands for the warmest of welcomes and the most unforgettable stay. Zulu Waters Game Reserve accommodation in Mooi River. Your own Private African Retreat, Zulu Waters offers you the exclusive use of its 7000 acre estate, your time here tailored to create the experience you want from Africa.There are three accommodation experiences each of which has its own unique character. Providence No. 5 Giants Castle Road. Self Catering accommodation in Mooi River. Cosy, comfortable fully equipped self-catering farm cottage. Large open plan lounge/diningroom with underfloor heating and fireplace. Two en-suite bedrooms, both with heated bathrooms (one with bath, second with shower). Gleneagles Manor House Guest House accommodation in Mooi River. Gleneagles is situated in the heart of Mooi River, surrounded with four acres of meticulously maintained lawns and tall oak trees. It is centrally located within easy access from the N3 and other major routes, which affords you the opportunity to explore the Midlands Meander. Midlands Saddle and Trout Self Catering accommodation in Mooi River. Set in the rich farmlands of KwaZulu Natal only 13km from Mooiriver, this country resort offers the perfect location for an outdoor family getaway with stunning views over meadows, dams and streams. Glenrock Game & Trout Self Catering accommodation in Mooi River. Glenrock has 6 self-catering, fuly equipped units for families and friends.We also cater accommodation, meals and activities for school and youth groups. Beechwood Country Cottage Self Catering accommodation in Mooi River. A charming, thatched cottage in lovely surroundings. Secure, spacious, private, well appointed and fully equipped for 2 – 4 guests. Two single beds in the bedroom with a sleeper couch in the lounge. Naval Hill Self Catering accommodation in Mooi River. Experience the culture of the Navy in a different manner!!! Luxury cabins fit for Admirals, overlooking the tranquil waters of the Mooi River. Hinterland Country Estate Home of Sharrow Spinning & Weaving Self Catering accommodation in Mooi River. We have one lovely brick built suite with en suite shower,kitchenette and close to main homestead. It has a double bed & a day bed, used as a couch but could sleep one child. Waterhoek Riverside Guest Farm Self Catering accommodation in Mooi River. Escape to a scenic and relaxing outdoor environment for families, groups, school outings etc. 3 x fully equipped chalets. Central functions room for casual conferencing, school groups, birthday parties etc. Mooi River – Mooi River takes its name from the Afrikaans. The early settlers were so impressed by the natural beauty of the river that they called it mooi (pretty). Mooi River – Mooi River is the Gateway to Giants Castle and forms the hub of the Giants Castle Route. Mooi River South Africa Mooi River is a farming and textile centre originally named Lawrenceville after the Irish farmer who formalised its settlement during the 1800s.